In almost every way, this school year was a lot of fun. I had four PAP Geometry classes and two Astronomy classes. My PAP kids were great (I also had about 16 8th graders who were generally adorable), and it was a blast finally being able to teach Astronomy. My schedule even worked out so that I did not have to have “Freshmen Lunch” (35 minutes). With that being the case, I will mention the few minor annoyances just to get them out of my system, and then go on to what I think worked, and what I’m changing for next year. 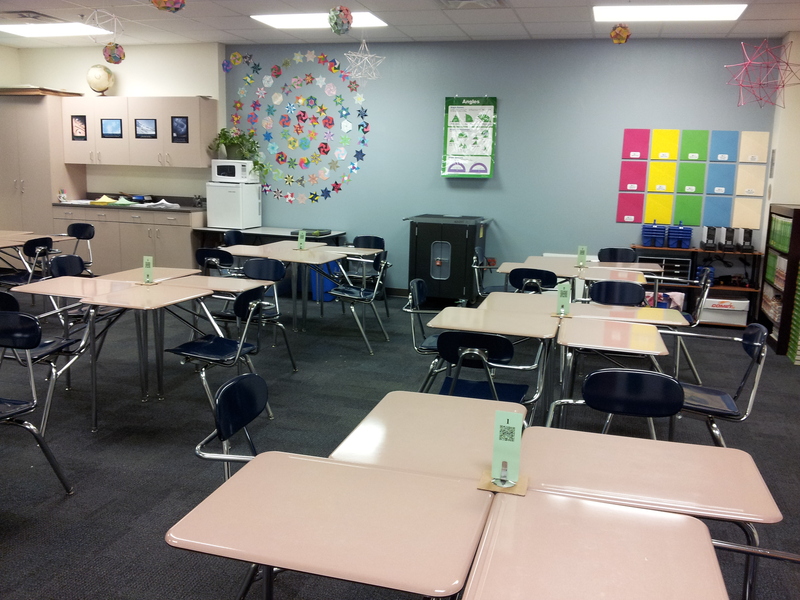 Not just a flipped classroom, but a flipped-mastery learning classroom! Canvas is a really good tool for the aforementioned classroom. Having students make a Kahoot quiz for their presentations is a great way to ensure engagement. This was our first week of school, and overall, I’d have to say it went pretty well. Because we are on a block schedule, I had my A-day classes three times this week. While my first day “Penny Floor” lesson wasn’t quite as engrossing as last year, I think it still went well enough. I definitely liked having all of my links for both my PAP Geometry and Astronomy classes on one page. With all of the various account setups we did in Astronomy, it made things very handy. The math department lucked out on our part of Freshmen Orientation–we just had to take our classes to the auditorium for the three freshmen assistant principals to go through everything they needed to know about being a freshman and staying out of trouble. In my Astronomy classes, I had set up a Blendspace assignment that they were to write a one-paragraph summary over and then take an Edmodo quiz. They were a little shaky getting started (and it didn’t help that on Wednesday youtube wasn’t blocked, but on Thursday, it was), but eventually everyone got done. On Friday, we had our first geometry lesson. Because I am doing a flipped classroom, they had (mostly) all done their notes over Points, Lines, and Planes, so I gave each pair of students a stack of cards. The students alternated drawing a card and reading the description to their partner who had to draw what was being described (I stole the idea from Kagan, but I added more cards). There were some great conversations! One of my students is blind, which I found out about on the Thursday before school started. I generally think things went well, but I have got to get ahead so I can get her material to her Braillist in time for the lessons. As it stands, I’m going to have to improvise something for the next couple of classes and hope that the material I’m going to send in makes it back by Friday. I haven’t really gotten to know much of anything about my students yet. Maybe it’s this way every year, but it sure seems as if I should recognize more of them by now. After a week of introductory stuff, we are finally going to be starting astronomy lessons! The plan is for them to spend about three class periods researching an ancient civilization’s astronomy and then make a presentation to the class. This is the first time I have had a class doing presentations, so I’m a little nervous. 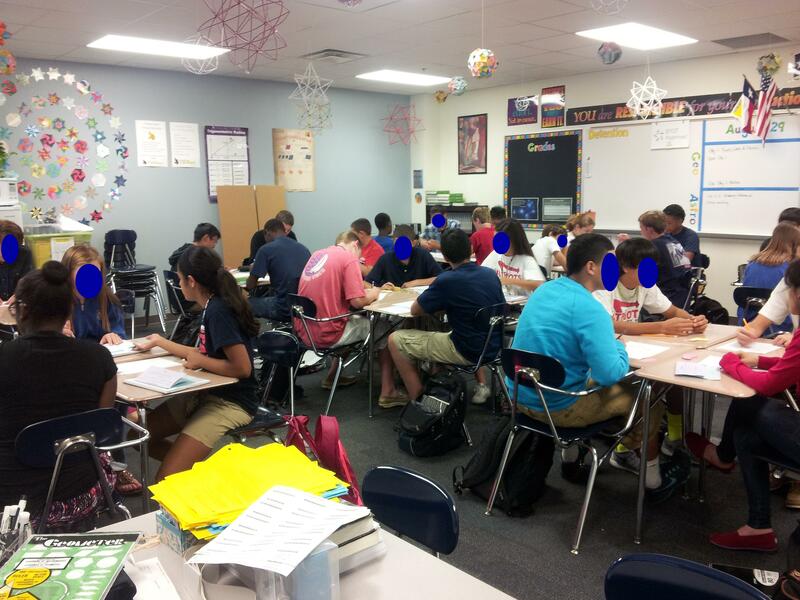 This is my 1st period PAP Geometry class working on a “Draw What I Say” activity for points, lines, and planes. I think it’s going to be a fun group–it’s a mixture of 8th and 9th graders. 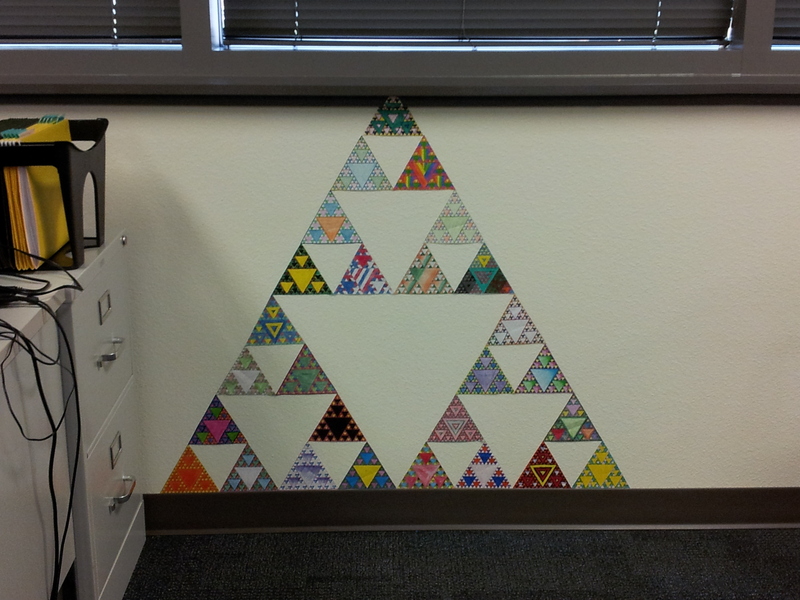 This is my Sierpinski triangle of student Sierpinski triangles. My plan (if I ever get any spare time) is to do an even bigger one on my back wall. You are currently browsing the archives for the Reflections/Review category.